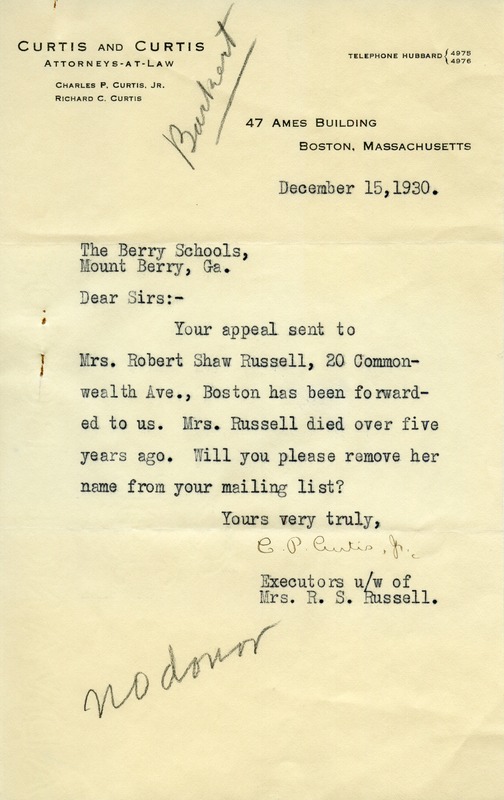 Martha Berry Digital Archive | Letter to The Berry Schools from C. P. Curtis Jr.
Letter to The Berry Schools from C. P. Curtis Jr.
C. P. Curtis Jr. writes as the executor for Mrs. Russell, explaining that Mrs. Russell died over five years ago and asks that she be removed from the mailing list. C. P. Curtis Jr., “Letter to The Berry Schools from C. P. Curtis Jr..” Martha Berry Digital Archive. Eds. Schlitz, Stephanie A., Jordan Brannen, Chelsea Risley, Meg Ratliff, et al. Mount Berry: Berry College, 2014. accessed April 19, 2019, https://mbda.berry.edu/items/show/13890.